Are you bored with the same old rehashed drum sounds you can find in dozens of sample packs and libraries these days? If you're still out there looking for something new and original, then you have to check this out! All the sounds in this collection have been designed completely from scratch with the goal of creating something truly unique in the world of electronic drums. Not a single preexisting sample has been used during the creation of these sounds: they're all completely original, built from the ground up—a full spectrum of carefully designed drum sounds. Get it now and you'll see how rich and evocative synthetic drums truly can be when done right! Within this library you'll find surgically precise sounds that will cut through your mix like a hot knife through butter. You'll find short, aggressive percussion sounds and longer, metallic stabs; expressive and clean kicks, sometimes grimed with unusual hums. From entirely and purposefully synthetic timbres to almost acoustic-sounding drums, you'll find it all here! No matter if you're working on minimal, experimental, club, or even pop music, in Plasticlicks you'll be sure to find exactly what you're looking for! 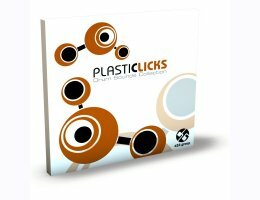 With Plasticlicks, we present you with a new world of sonic discovery: simply put, this is the new must-have drum collection for electronic musicians and producers everywhere! This production from D16 Group was created by a very talented sound designer S3MPL3X.